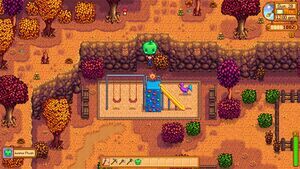 This page lists many of the secrets discovered in Stardew Valley. Clicking on the ConcernedApe logo during the loading screen will cause the sunglasses (if present) to disappear and the eyes to open. A duck/splat sound will also be heard. The game keeps track of how many times you have launched it. Friendly messages appear in the bottom left corner of the ConcernedApe logo screen based on how many times you have launched the game. 3 Plug in an Xbox One or Xbox 360 controller to activate game pad mode. 4 Tip: Giving gifts is a good way to make friends with the residents of Stardew Valley. 5 Tip: Shift-click to purchase 5 items at a time. 6 After upgrading your hoe or watering can, hold down the tool button to increase the area of effect! 7 Tip: Right-click to use a weapon's special move. 8 Watch TV shows to learn useful tips, cooking recipes, and more! 9 The traveling merchant visits Stardew Valley once a week. She sells a wide variety of goods, often at exorbitant prices! 30 Challenge: Beat Journey Of The Prairie King without dying. 100 You've started the game 100 times. 1,000 You've started the game 1000 times! If you use a controller, pressing B on Xbox or O on PS4 will cause the clouds around you to move at a rapid pace. Only works where the two birds are flying, and stops upon the menu coming down. On the title menu of the game, click the letter "E" in "Stardew" 10 times to see an alien open a door behind the letter. It will smile and wave for two seconds before it fades away. Clicking on any of the leaves for a total of 10 clicks will cause 3 Junimos to appear in the logo and wave. 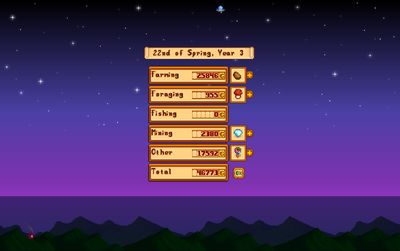 Entering ConcernedApe as the favorite thing when creating a character results in some additional text when consuming a Stardrop. A few rare animations can be seen in the background of the Shipping screen at the end of the day depending on certain conditions. Numbers over 999,999 will overflow on the blank space and will move up and down in a wave pattern. 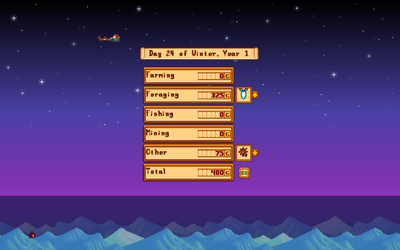 On the 24th of Winter, Santa Claus can be seen with a few reindeer crossing the top of the screen. If it is not the 28th and it did not rain, there is a 0.001% chance of a UFO crossing the top of the screen. "The lonely stone on the Stardew Valley map." The lonely stone is not an area, but it has a location on the Stardew Valley map. Upon clicking the lonely stone on the map, a rock sound effect will play. After clicking on the lonely stone and around the time when the rock sound effect is played, the map screen will close entirely. The lonely stone also hasn't been mentioned by any villagers/characters nor is there any lore about it hidden in game files or mentioned by ConcernedApe. The plaques that can occasionally be found on the walls of the Skull Cavern have been found to contain text encoded by a cipher. The plaques that are found on the rough walled levels have been deciphered to give the following. This may be a reference to the Purple Slimes that can drop Iridium Ore that are frequently found in large numbers at these levels. This may or may not refer to the Wizard who lives in Cindersap Forest. If a Super Cucumber is placed inside the brown box located in the fenced area north of the Blacksmith, the ??HMTGF?? statue will be acquired. If Duck Mayonnaise is placed inside the partially-hidden metal box in the back room of the the Stardrop Saloon, the ? ?Pinky Lemon?? statue will be acquired. If a Strange Bun is placed inside the chest in Vincent's room, at 1 Willow Lane, the ??Foroguemon?? statue will be acquired. Note: For each of the locked boxes, ensure only a single item is being held. If a stack is held, the entire stack will be consumed. After finding and donating all four Dwarf Scrolls to the Museum, the player receives the Dwarvish Translation Guide. If the player proceeds to the Graveyard, one of the previously unreadable tombstones can now be read. This points the player towards The Desert and the set of three pillars to the Northeast. Stepping into the center of the pillars while holding a Prismatic Shard will cause the shard to be transformed into the Galaxy Sword. Due to the way that item ID numbers work, if the 75th wallpaper is held in the middle of the 3 pillars, it will act like a Prismatic Shard and will be transformed into a Galaxy Sword. Note: Ensure only a single prismatic shard is being held when entering the three pillars. If a stack is held, the entire stack will be consumed. The Junimo Plush is a unique piece of furniture. It can be found by shaking a bush in the northwest corner of Pelican Town on the 28th of any season at exactly 12:00pm. Slimes can be hatched in odd places using a Slime Incubator, including Pelican Town or the Railroad. Slimes hatched in the town are known to interact with the townfolk, including greeting them by name and having the townfolk greet them back. Note that this doesn't work in all locations, in some places slimes will be removed overnight. Slimes can also be hatched inside the Farmhouse. If you are married, your spouse may react to the slime with various funny dialogue while trying to kill it. When entering "Name", "Farm Name", or "Favorite Thing" on the Character Creation menu, certain keys produce special sounds and/or symbols. Pressing the following keys will produce special sounds. Pressing the following keys will produce special characters. Pressing controller buttons also produces special sounds and/or symbols. If you enter item ids as the character name within brackets (e.g.,   ) the items will automatically spawn when a villager says the name in a dialogue. Note that the field accepts only 14 characters, so at least one object ID must be only 2 numbers (not 3). Note also that most dialogues refer to the player's character by first name only, so the most desired item should be entered first. The glitch works when purchasing an animal, but only once after buying it. If dialogue is not said by a villager (e.g.,    looks really happy today!) the items will not automatically spawn in. Naming a character with an invalid item id (such as ) will generate an Error Item. The message says: "ConcernedApe: Nice try..."
The first time you input /ca, /ape, or /concernedape, you receive a message saying: "Hello. I hope you're enjoying your new life here. Take care!" Thereafter, you receive a message saying: "ConcernedApe is hard at work..."
If you input /qi, you will recieve a message from Mr. Qi. The first time it wiil say: "Mr. Qi: Hey, kid. Yeah, I'm here. What'd you expect?" The second time, you will receive the message: "Mr. Qi: Hey... keep up the good work, and never stop striving for success! I'll see you soon, kid..." Thereafter, you receive the message: "Mr. Qi is away". The title screen easter egg that spawns junimos after 10 leaf clicks was originally found in the source for the 1.1 beta, but is not present in earlier versions. This page was last modified on 12 December 2018, at 19:26.